After languishing at ï¿½The Quay of Oblivion" for 4 years and after many failed attempts to sell her the S.S. FRANCE would leave from her home port of Le Havre, France on August 18, 1979. Renamed S.S. NORWAY she was bound for the Hapag-Lloyd shipyard in Bremerhaven Germany. Over the next year she would be transformed from a cold weather indoor Atlantic liner to an outdoor warm weather Caribbean cruise ship. She would sail from her new home port of Miami in June 1980. Her once black hull now sporting a deep navy blue color scheme, her twin red and black funnels now painted white, with a two-tone blue striping, dark blue cap and wings. Over the next 23 years other refits saw modification to her funnels that diverted the smoke to vent from the top instead of the wings, they would also change in color to all dark blue with the gold "NCL" surrounded by a gold frame on both side. 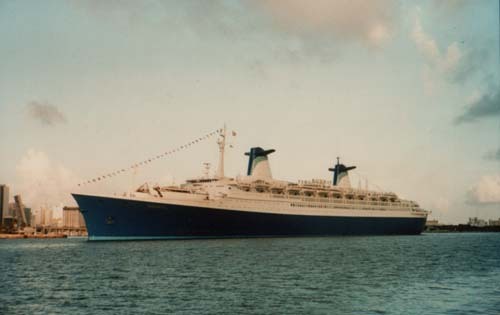 The S.S. NORWAY would cross the Atlantic in July 1984 for a series of 11 cruises, starting with a 2 night cruise to nowhere from Philadelphia, then an 8 night transatlantic crossing from Philadelphia to Southampton. She would spend the next two months cruising the Norwegian Fjords and to other European Countries. She would return to Miami in October with an 11 night transatlantic crossing from Southampton, with calls at Bermuda and Nassau. A new top deck with 82 cabins was added in August 1990 altering the ships profile forever. On September 10, 1996 the S.S. NORWAY would return to a jubilant Le Havre for the first time since her departure in 1979. A reception of small pleasure craft greeted her at the breakwater, and fireboats sprayed water in the air as they escorted her to the pier. From the beach and surrounding area an estimated 100,000 people watched the return of their beloved ship. One story has it, that as a condition of the sale to NCL the ship could never return to France, but with the ship almost 35 years old the French decided to let her return. 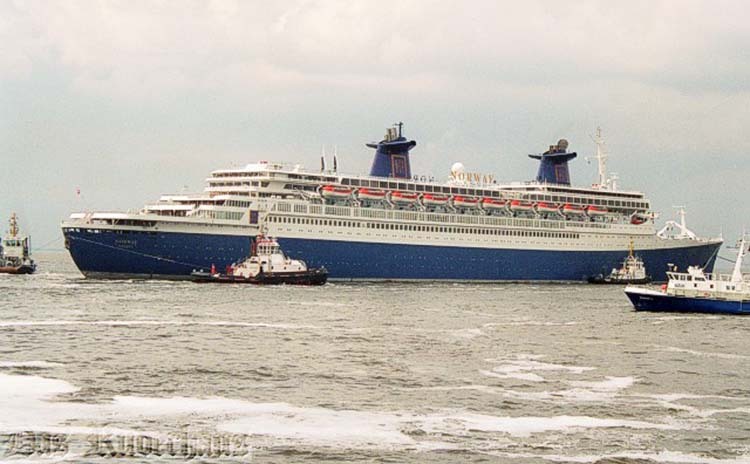 The S.S. NORWAY was crossing the Atlantic on what was to be her "Farewell Cruise" on September 11, 2001 leaving New York just days before the attack on the World Trade Center. NCL's parent company Star Cruises had plans to reposition the ship in the Far East, but after a short lay-up and refurbishing in Germany was brought back to Miami in December and resumed her former Caribbean schedule. At 5:30am on May 25, 2003 the S.S. NORWAY while docked at the Port of Miami experienced a boiler room explosion that killed 8 crew members and would send her back across the Atlantic, this time under tow to a Bremerhaven lay-up and to an even more uncertain future. S.S. NORWAY sails from the Port of Miami on her maiden voyage with passengers. June 1, 1980. In an announcement made on March 17, 2004 by Norwegian Cruise Line's president Colin Veitch. 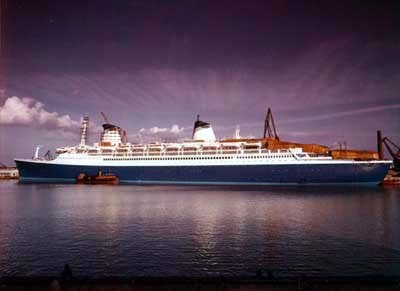 "The S.S. NORWAY would not be returning to the North American cruise market. It was decided not to re-engine the 42-year-old ship due to the expense. The company is continuing to evaluate appropriate options for the vessel." It is reported that plans for her use as a static hotel ship are being examined but that she will not be docked in the United States. At that time she was listed for sale for 25 million dollars. Foto ï¿½ in 2005 by Raoul Fiebig (Paderborn, Germany). Keine weitere Verï¿½ffentlichung ohne schriftliche Genehmigung des Fotografen! Bitte beachten Sie unsere Copyright- und Datenschutzhinweise! 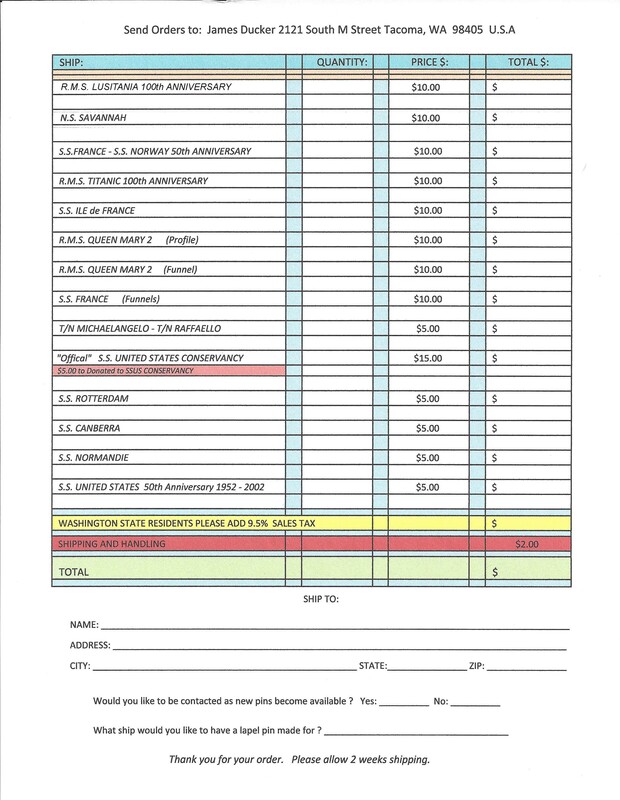 Permission has been given by Raoul Fiebig for the use of the above picture. Under tow from the tug DE DA the S.S. NORWAY left her Bremerhaven lay-up on the morning of May 23, 2005 with a destination of Malaysia. It was expected to take over seventy days for her to reach Singapore. In route the NORWAY arrived off the South African port of Cape Town at noon time on July 1. The tug SMIT AMANDLA took over the tow from the tug DE DA. DE DA later entered the port to take on bunkers and resumed the tow on July 2. On the afternoon of August 13, 2005 the S.S. NORWAY arrived off the Port of Klang, Malaysia. The S.S. NORWAY under tow took 82 days to make the voyage from Germany to Malaysia. Many speculated that she would never make it to Malaysia, that she would end her life on the beaches of an Indian scrap yard. It had been reported that Star would give the S.S. NORWAY one more year before making a final decision as to her fate. This would also give preservation groups trying to save her a chance to raise the needed money. As 2005 drew to a close it was being reported by various groups that the S.S. NORWAY had been sold to scrap dealers for $25 million dollars. By late January 2006 however Star Cruises had reacquired the ship after it was learned they faced multi-million dollar fines for attempting to avoid environmental laws concerning the asbestos and other toxic materials onboard the S.S. NORWAY. Star Cruises had been told that environmental laws would not allow the ship to leave German waters if the intent was to tow her directly to a scrap yard. The asbestos and other toxic materials would have to be removed and disposed of in a safe manner before the ship would be allowed to leave Bremerhaven. Star at that time stated that the ship was to be repaired and would be used as a gambling ship and the center piece at a planned theme park; also other options were still being evaluated. Remaining at her Port Klang anchorage with the "NCL" logos removed from her funnels, the neon-gold lettering spelling out her name gone and the name on her bow now reading "Blue Lady", the ship remains in limbo. Colin Veitch stated that the more famous art from childrenï¿½s playroom, and both dinning room where removed before the ship left her Malaysian anchorage and could see it's use on future NCL new-builds. As of early March 2006 it was beleived that she has again been sold to an un-named scrap dealer. Loyal S.S. NORWAY lovers still held out hope that she maybe be saved and another use could be found. 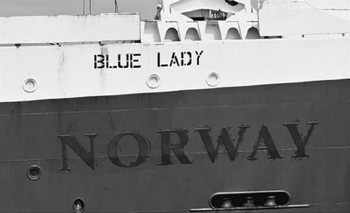 Black paint now covers the lettering spelling "NORWAY", her new name "BLUE LADY" stenciled above. 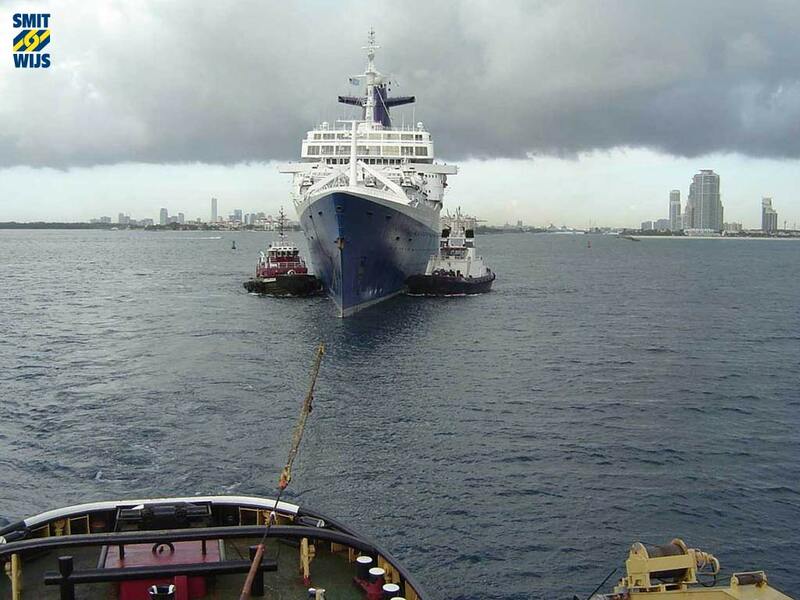 On the morning of May 5, 2006 two ocean-going tugs prepared to tow the legendary S.S. NORWAY, now named ï¿½BLUE LADYï¿½ to the beaches of India. 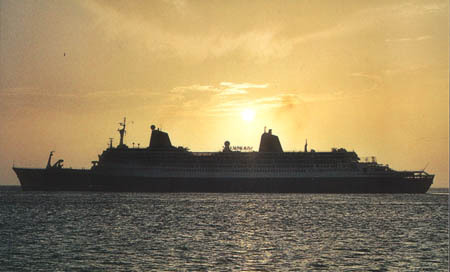 The once classic transatlantic liner sailed into the darkest chapter in her 44 year history. Despite protests from Greenpeace and The Indian Platform on Ship-breaking, the Indian Supreme Court ruled on June 5, 2006 that if safety concerns about the asbestos and other toxic chemicals, an estimated 1,200 tones, could be safely and environmentally disposed, then the ship that started the present day mega liners boom would be allowed to enter territorial water and run aground. A group from Dubai, United Arab Emirates called "Blue Ribband - Gulf Dessert LLC" wanted to buy the ship and use it as hotel and entertainment center in the fast growing tourist region. This plan never seemed to materialize. 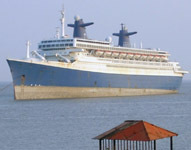 The 1,035 foot ï¿½BLUE LADYï¿½ former S.S. NORWAY, S.S. FRANCE arrived off the coast of India on July 7, 2006 and was allowed to drop anchor while awaiting a court ruling. 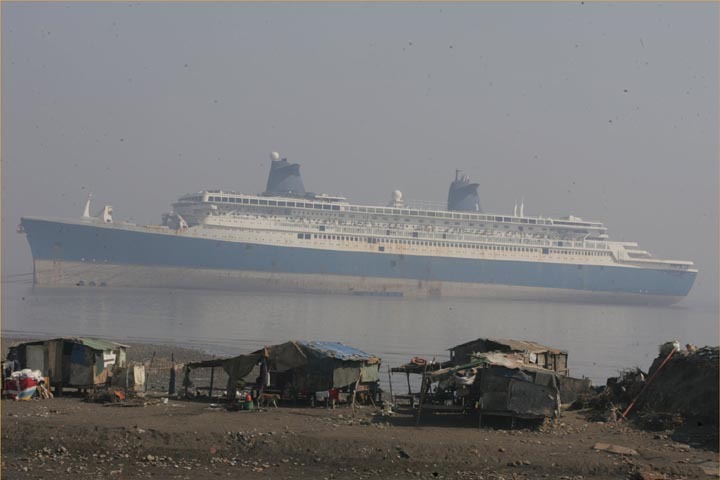 A team of from the Gujarat Pollution Control Board inspected the ship from July 8 to 11 and it was determined that the shipyard at Alang could safely remove and dispose of the asbestos and other toxic chemicals. Environmentalists protesting the toxic waste and asbestos that was onboard the ship filed law-suits with the Indian government to stop the ship from being allowed to run aground. On August 1, 2006 India's Supreme Court ruled that the ship could be run aground and safely scrapped. In February, 2006 the ship had been turned away from Bangladesh ship breakers on the grounds that it was to toxic to be dismantled there. On the morning of August 15, 2006 the former S.S. NORWAY helped by tow tugs to build the necessary momentum was beached in plot number 1 after completing all the required formalities. Over the next month the liner will be prepared for scrapping. In mid November she was pulled closer to shore, but still was awaiting the courts final decision. December 4, 2006. 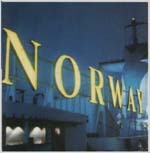 The Indian court put off until March 2007 any decision to allow the NORWAY to be scrapped. The owners where told not to remove anything from the beach liner. The NORWAY has been sitting on mud the since August 2006. In March 2007 the Indian courts ordered a study to be made to determine whether the neglected liner can be environmentally dismantled. Any hope of her returning to any type of service seems to slip by each day. July 2007 - In a bazaar twist to the already strange and sad fate of the S.S. NORWAY, it is now claimed that the ship is radioactive. Fire detection systems may contain a small amount of radioactive material. Reports say that the ships once elegant interior is covered with mold. On September 11, 2007 the Indian Apex court ruled that the BLUE LADY ex. NORWAY ex. FRANCE could be scrapped. The long wait is over. 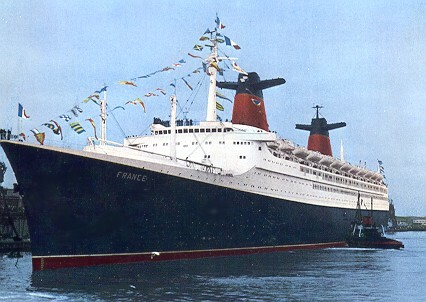 For 12 years she sailed as the S.S FRANCE, flagship of the Compagnie Generale Transatlantique ï¿½French Linesï¿½; later would sail another 28 years as flagship of Norwegian Cruise Lines as the S.S. NORWAY. January 2008. Image pulled from the web. Unkown Photo Credit.